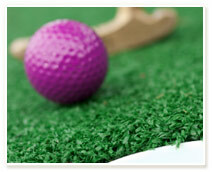 Journey through our action-packed 18 hole, par 36, Jungle Quest mini-putt adventure. As you navigate along a winding fun-filled jungle expedition you will encounter treacherous lush terrain (watch out for the water hazard on hole 15) as well as native wildlife hiding around every corner. The #5 signature hole is a tricky par 2 that leads right into the waterfall tribal crypt. A straight steady shot is required in order to sink your putt. Be careful not to disrupt the slumber of the dead with a rough shot! A fun-filled adventure for all ages, Jungle Quest mini-golf is fully lit and features realistic jungle sounds. A round of mini-putt can be enjoyed for a small charge of $5 per person.